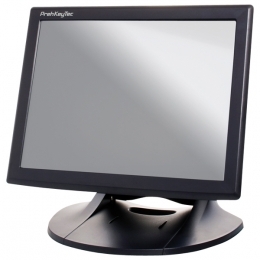 PrehKeyTecs MTE 15 touch monitor is the best solution for retailers and system integrators who need to meet the highest quality requirements at a top price-performance ratio. High performance and brand components such as the Elo touchscreen guarantee many years of reliable operation. Thanks to its space-saving design, the touchscreen fits into almost any workplace. Sophisticated features, for example lockable controls located on the screens side to prevent accidental use, make the MTE 15 perfect for highly frequented areas as well as customer transactions. During the development of the MTE 15 touch monitor, absolutely all requirements for check-out and production were considered the screen boasts a wide variety of functions, yet remains surprisingly compact. The extremely space-saving 38.1 cm 15 housing does not require large spaces. The stable, heavy stand ensures that the device can be utilised in any surrounding, and the flexibility-based concept allows placement of the monitor in any vertical position, as well as flat on a desk. It is therefore operated directly from above, which often is the more ergonomical solution, for example in hospitality or at service points. Using the VESA-mount option you can position the monitor on a wall directly or with its stand, saving a great amount of space. Any user can see at first glance that the image displayed by the LCD monitor is rather large for a 38.1 cm 15 screen. Although smaller than usual 38.1 cm 15 monitors, the image size displayed corresponds to that of a 43.2 cm 17 CRT monitor. The monitor has a resolution of 1024x768 pixels providing a pin sharp picture. With a contrast ratio of 5001 and a brightness of 250 cd/sqm, the monitor renders 16.2 million colours in pin sharp quality and is equipped for the most demanding applications. The proven and reliable five-wire resistive touch technology ensures smooth operation. The screen always reacts immediately and accurately when touched with a finger even gloved, a fingernail or other objects. These screens are protected against harsh environmental stress by spilled liquids and splashed water, high humidity levels and cleaning, making them particularly resistant to contamination. This makes the MTE 15 the perfect device for check-out, industry and medical applications. The high hardware quality in terms of reliability and durability guarantee drift-free operation over a lifetime of more than 35 million touches. Data transmission via USB or RS232 offer you a fast connection and high working ergonomics. The monitor is sealed and thus protected against dust, dirt and liquids, allowing it to be used safely at the counter, in a clinic or in an industrial area. The MTE 15 can also be used to complement demanding cashier station applications by upgrading it with an optional 3-track magnetic stripe reader. The reader is mounted inconspicuously on the side of the housing, saving space. As the reader requires no additional power supply, it avoids annoying cable clutter. In a few simple steps, it can also easily be retrofitted on site.